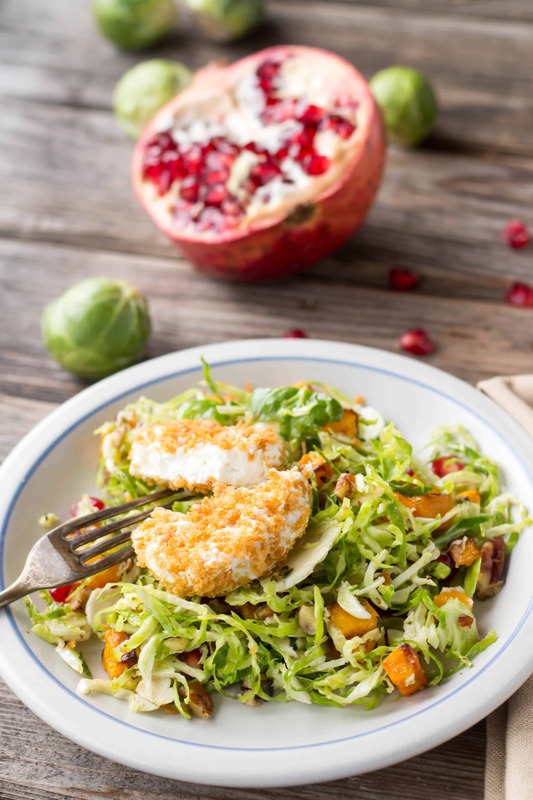 This shaved Brussels sprout salad with butternut squash, pomegranate and oven “fried” goat cheese is elegant enough for company, but easy enough for weeknights. A great recipe for Thanksgiving. It’s fascinating how much the dialogue on vegetables has changed since I was younger. Growing up I’d never tasted a brussels sprout, and definitely never wanted to. They were in this category of nasty, elusive vegetables along with lima beans, beets and rutabagas. 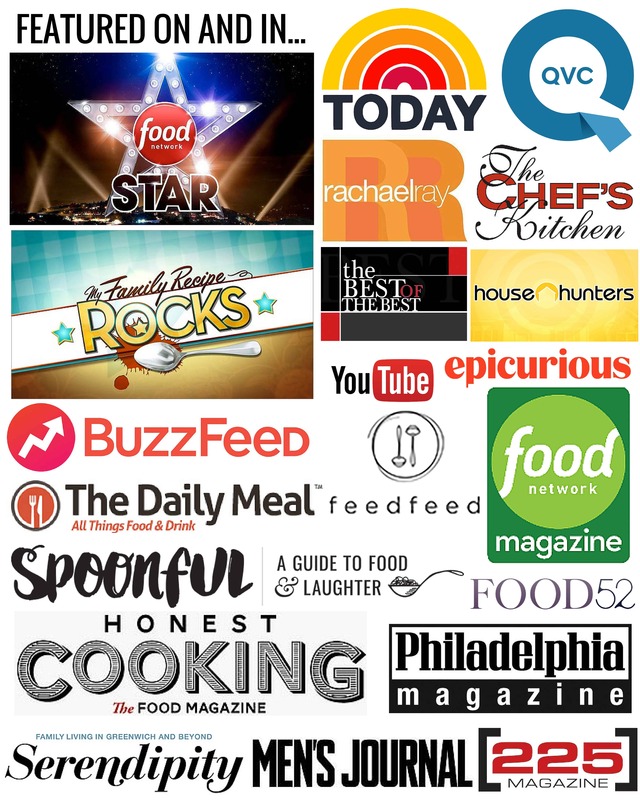 I had never actually experienced any of these foods, but I knew I detested them. My opinions were based solely on the commentary from 90’s sitcoms and Nickelodeon cartoons. In retrospect, it’s crazy to think that this was ever actually a widely accepted ideology. Why a group of intelligent adults would teach impressionable young children to abhor an entire group of nutritious, environmentally friendly foods is puzzling. The stigma attached to brussels sprouts and the like has been around as long as I can remember, yet in recent years there’s been a massive shift in how we approach plant based food. Thanks to the various movements towards eating “real food,” brussels sprouts have suddenly become one of the most talked about and heavily consumed vegetables on the market. It’s a incredible to see how much the perception has changed in such a short amount of time. Whenever I hear someone gush about how much they love brussels sprouts, I can’t help but laugh to myself because seems like just yesterday they were regarded as one of the most despicable vegetables on the planet. They’ve gone from being the most hated to the most loved vegetable in the country practically overnight. What was once only served completely cooked to death and smelled like rotten eggs has now been adopted by chefs all over as being one of the most versatile and exiting vegetables to play with. We’ve all come to appreciate the crispy, caramelized flavor of a well-roasted sprout, but have you ever tried them raw? Sliced nice and thin, raw brussels sprouts have a texture more tender than cabbage, but more substantial than lettuce. They can stand up to a myriad of bold toppings and dressings without ever taking over. Raw brussels sprouts are sweet, mild and fresh – a far cry from the putrid, mushy spheres that was once all we ever knew they could be. I had my first taste of raw brussels sprouts last year at Atchafalaya restaurant in New Orleans in a salad made by my friend and former Food Network Star competitor Chris Lynch. The sprouts we’re shaved nice and thin, tossed with green apples, pecans and a bacony vinaigrette. It was topped with a fried medallion of goat cheese, which was warm, creamy, crisp and gave a lovely contrast to the cool, fresh sprouts. After the first bite, I was suddenly enlightened to the beauty and possibility of raw brussels sprouts, and knew I had to give them a try at home. Now, that fried goat cheese? That’s where it’s at. If there’s anything that can improve goat cheese in the first place, it’s coating it in crispy breadcrumbs and warming it to an oozy, gooey state. But having to go through the process of frying solely for an accent on a salad seems a bit exorbitant. We’re home cooks, which means we need to do all the clean up ourselves, and that makes unnecessary frying out of the question. So to solve the problem, I’ve developed a method of first toasting the breadcrumbs, coating the goat cheese and then gently warming in the oven. You get the same overall effect with only with a fraction of the effort. Thanksgiving is coming up next week and I’m willing to bet you’re still looking for something to make (like me!). If your menu’s been set for months and you already have half of it prepped well la-di-freaking-da for you. To all my procrastinators out there, consider adding this one to your long list of options. Nearly all elements can be made in advance, it’s healthy while still being a little bit decadent and it’s totally on trend for fall. Plus, the best part? Kids will eat it, too. 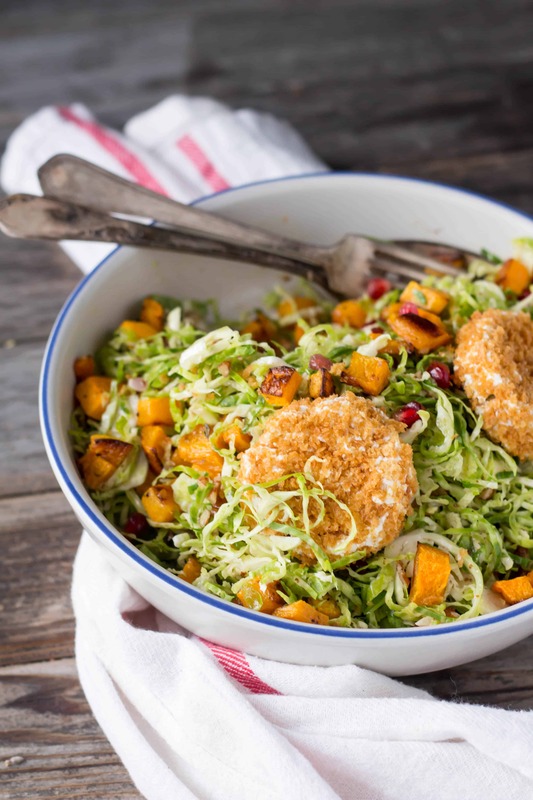 For more healthy Thanksgiving recipes, try my detox(ish) kale salad, roasted beet + green bean salad or roasted radicchio and grape salad. And here’s an easy trick for removing the seeds from a pomegranate without making a mess! 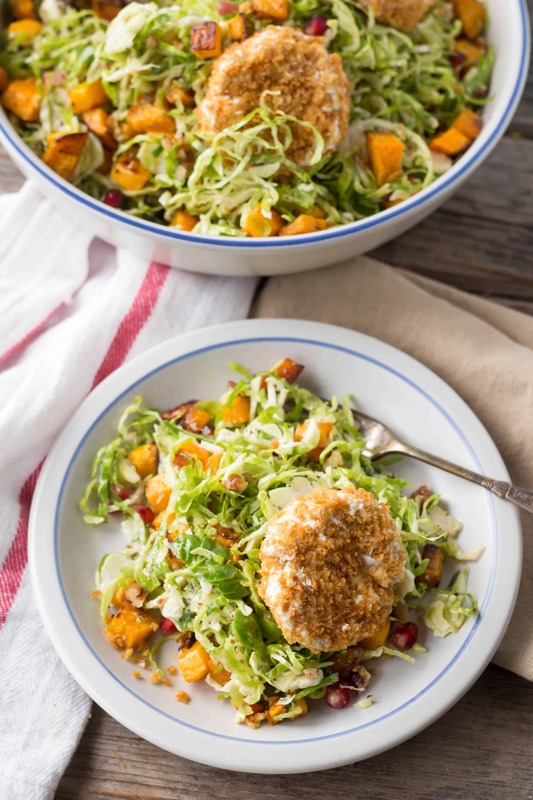 This shaved Brussels sprout salad with butternut squash, pomegranate and baked goat cheese is elegant enough for company, but easy enough for weeknights. Slice off the bottom of each brussels sprout and remove any brown spots. Use the slicing blade of a food processor, a mandolin, or a sharp knife to finely shred them, and place into a bowl. 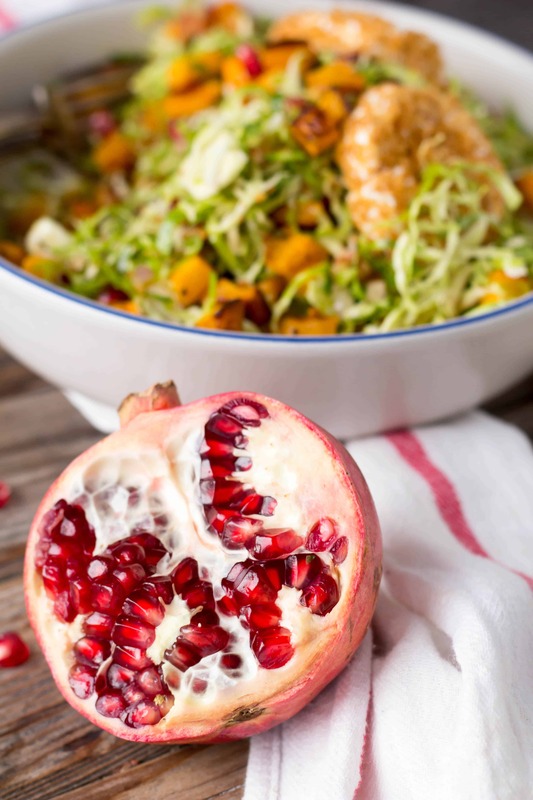 Top with the squash, pomegranate seeds and pecans. 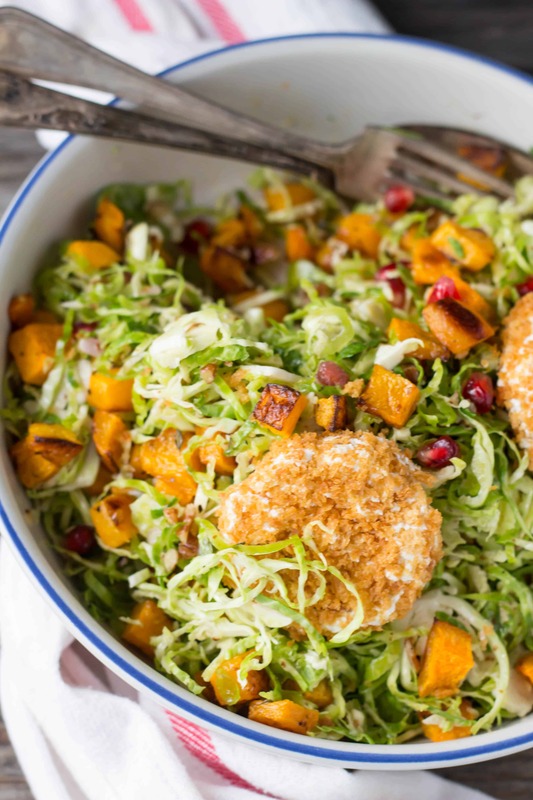 Set aside while you make the dressing and goat cheese. Preheat the oven to 350 degrees. Toss the breadcrumbs with olive oil until each piece is coated. Spread evenly on a baking sheet, then place in the oven for about 10 minutes, checking and stirring every so often to ensure they toast evenly. When the breadcrumbs are golden brown throughout, remove from the oven and allow to cool to room temperature. Lower the oven to 325. Slice the goat cheese into 6-8 medallions, then press each one into the cooled breadcrumbs to coat on all sides. Place on a sheet pan, and then hold in the warm oven until ready to serve (at least 10 minutes, but no more than 30). While the goat cheese is warming, mix up the vinaigrette. Combine the shallots, vinegar, mustard, honey, salt and pepper in a small bowl. Slowly stream in the olive oil while whisking until emulsified. Taste for seasoning and adjust as needed. Toss the salad with the vinaigrette until nicely coated, then arrange on a serving platter. Remove the goat cheese from the oven and arrange over top of the salad. Serve immediately. 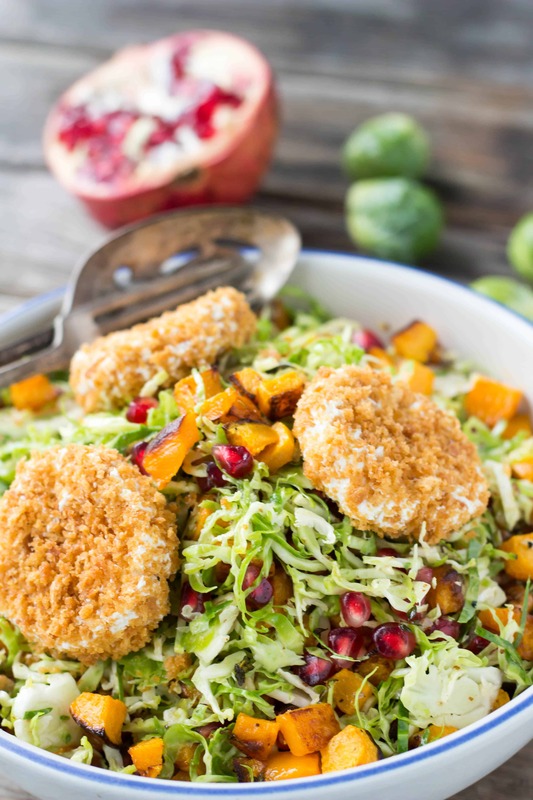 *All elements of the salad can be made ahead of time and stored separately: shred the sprouts, roast the squash, remove pomegranate seeds, toast pecans and breadcrumbs, mix vinaigrette, slice and coat the goat cheese in breadcrumbs. When ready to serve, warm the goat cheese in the oven for about 20 minutes, then toss the rest together with the vinaigrette. Top with warm goat cheese and serve immediately. Mmmm… Mmmmm…. Mmmmm… Well, our menu IS already set, but I think I’ll have to try this one on the weekend… what’s not to love about goat cheese? I may even do this for our annual Christmas Eve open house! Thanks, Coley!! You ROCK!!! I love everything about this recipe, pinned!